Founded in 1942 by the Oriol and Goicoechea families, Talgo is a leading specialist design and engineering company providing differentiated equipment, solutions and services for the global passenger rail transportation markets. The company’s two key business lines are (i) design and construction of rolling stock and (ii) maintenance of the rolling stock under long term contracts. Talgo has developed a distinctive suite of proprietary technologies over several decades. This has enabled Talgo to lever the innovative technologies into niche markets as well as penetrate new geographies. The successful development of various technological innovations have placed the company at the forefront of the railway sector, including its variable gauge system, natural tilting, variable gauge for driving axles, bi-axle running gear with independently rotating wheels and high-speed and very-high speed trains. In the HS market, Talgo has c. 60% market share in Spain, and, after successful awards in US, Kazakhstan and Saudi Arabia, has become a key player worldwide. Talgo employs over 2,000 employees and has operations in Spain, Germany, Kazakhstan, Russia and the US. In 2006, Talgo had a fragmented shareholding base with divergent interests and desire for liquidity. In that context, Trilantic Europe sourced the transaction on a proprietary basis through the support of a Trilantic Advisory Council member. With Trilantic Europe’s investment, Talgo was able to institutionalise and professionalise the family-run business through a more stable shareholding base, the arrival of value-added independent board members with vast industry experience globally, and Trilantic Europe’s support to a strong management. Headquartered in Pfullingen (Baden-Württemberg, Germany), Prettl SWH (the “Company”) is specialised in the design and production of cable solutions for the automotive industry. 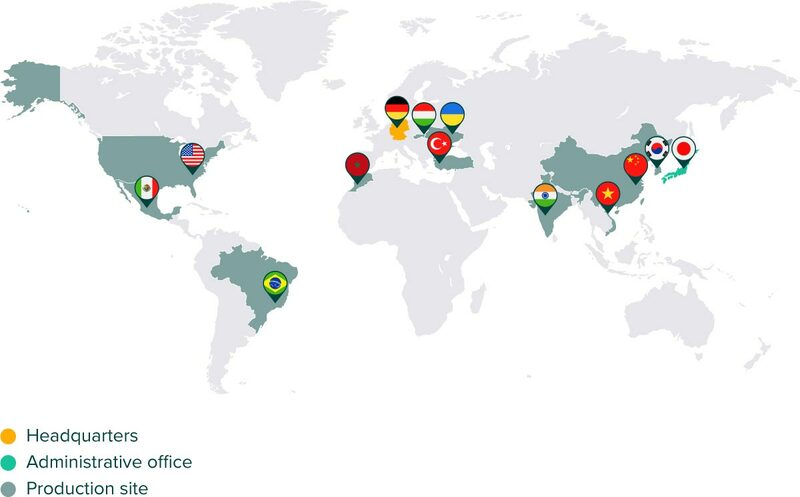 The Company is operating with a global footprint of 17 locations across 12 countries. Prettl SWH supplies a global base of Tier 1 automotive manufacturers with specialty wire-harnesses used to connect sensors to control box units in sub modules of cars. Prettl SWH is focussing on sensor applications in the area of efficiency, powertrain, e-mobility, safety and autonomous driving. Trilantic entered into a partnership with the founding family to support the existing management team in their strategic initiatives to grow the international footprint, expand the customer base, as well as increase investments in product- and process development. Trilantic facilitated the carve-out of Prettl SWH from its parent-conglomerate Prettl Group. Prettl SWH is now operating as a stand-.alone entity. As part of the partnership, the Trilantic Europe team has been supporting the Company and family via relevant initiatives including amongst other the global roll-out of SAP, building out the Company’s global R&D function, as well as the global sales and product management organisation. Furthermore, the Company has continued its international expansion and opened two new production facilities. For example, the new state-of-the-art production facility in Vietnam, which was opened in 2016, is today the largest facility across the Group with approximately 12,000 sqm production floor space. Gamenet was founded in 2006 by CRIGA, a consortium created by slot-machine operators to participate in the public process for the concession of slot network management. The company is one of the major operators in the Italian gaming sector, with a very strong presence in the slot-machine and video-lottery (“VLT”) businesses. Operating as the third Italian largest gaming company, Gamenet has four business units: (i) AWP (Amusement With Prizes) machines, (ii) VLT (Video Lottery Terminal), (iii) Retail & Street Operations and (iv) Betting & Online. Headquartered in Rome, Gamenet owns a widespread gaming distribution network, serving over 11,000 points of sale, 700 gaming halls (of which 65 directly owned) and 750 betting shops and corners licenses. Since its establishment in 2006, Gamenet evolved from a pure AWP concessionaire into a well-diversified gaming operator. As of 2010, thanks to the resources provided by Trilantic Europe, the Company was one of the first players to roll out a network of approx. 8,000 VLTs, which had been introduced in the market by the regulator under a multi-concession regime. During the first two years of the investment, Trilantic directly managed the company and was instrumental in the successful roll-out of the VLT licenses. Since Trilantic Europe’s entry, the company has been able to grow its EBITDA from €14mn in 2010 to €75mn in 2016 (32% CAGR). Such impressive growth has been achieved through organic growth and M&A, and thanks to a complete organizational turnaround, with the introduction of new internal functions, control procedures and monitoring tools. Under Trilantic Europe ownership the number of employees grew from 73 to 571 in 2016. Euskaltel, headquartered in Bilbao (Spain), is the Basque region’s leading telecommunications operator and market leader in fixed line, broadband and Pay TV. Since its foundation in 1995, Euskaltel has proven to be an innovative and pioneering company, resulting in its current leading position across all markets. Euskaltel’s success story is based on four key pillars: a customer focus approach with state-of-the-art network, best-in-class service quality and a strong well-established local brand. In 2012, as the overall Spanish economy was facing an unprecedented downturn, the historical shareholders of Euskaltel, mainly local saving banks as well as government entities, were going through a period of divestment and rationalisation on the back of the significant reforms implemented in Spain and in the European banking industry. In that context, Trilantic Europe had the opportunity to invest in a regionally undisputed telecom leader, benefiting from a very attractive network and customer loyalty, and operating in a sector with significant barriers to entry. Given Trilantic Europe’s strong relationship with key stakeholders, and its strong reputation and successful track record in the Basque Region, we had the opportunity to acquire a substantial stake in Euskaltel. The new shareholding framework allowed Trilantic Europe to support Euskaltel in its transformation and growth journey to become a best-in-class player. A leading producer and distributor of a large range of seafood products. MW Brands (currently known as Thai Union Europe) is a leading producer and distributor of seafood products, primarily canned tuna, in France, the UK and Italy. Prior to our investment, the company was a collection of commercial and manufacturing assets within the Heinz group, with leading brands Petit Navire and John West in France and the UK, controlling approximately 30% of their respective markets. The company also owns Italian canned seafood brand Mareblu. MW Brands has a vertically integrated supply chain and is involved in every step of the tuna canning process, from managing fishing vessels in the Indian and Atlantic oceans to fish processing in canneries located in the Seychelles, Ghana, France and Portugal. Through the unique access and knowledge provided by Trilantic Europe’s Advisory Council member, David Williams, we had the opportunity to buy an “orphaned” French headquartered division of Heinz which lacked focus and was not a corporate priority but included an attractive portfolio of European brands and strategically located production assets. MW Brands is a high cash flow generating business with low capex and overheads, run by an experienced management team, led by 35-year industry veteran Adolfo Valsecchi. Trilantic Europe, prior to the launch of the sale process, had a privileged access to Heinz’s management and partnered with a team of 3 former Heinz senior executives, led by David Williams, whose responsibilities during their tenure at Heinz included supervision of the business as CEO EMEA and CFO of the overall Heinz Group. Trilantic Europe has been actively involved in a number of initiatives that supported value creation for Talgo. One of the main avenues of value creation was Talgo’s international expansion which was achieved by supporting the company’s commercial efforts with a stronger focus on projects such as Kazakshtan and Saudi Arabia. Additionally, by supporting Talgo in the development of new product offerings, the Company was able to expand its addressable markets in the VHS and regional commuter train segments. The various value creation initiatives allowed Talgo to consolidate its role as a leading player with global reach, best-in-class technology and unparalleled competitiveness, as demonstrated by numerous project awards. The company was listed on the Spanish stock exchange on the 7th of May 2015. As a result of the IPO, Trilantic Europe partially divested its stake. From its reference shareholder position, Trilantic Europe continues to actively support Talgo on all operating, commercial and financial fronts. Today, Prettl SWH is well positioned to significantly benefit from relevant global automotive megatrends such as e-Mobility and Autonomous driving. With regards to e-Mobility the Company is relying on a dedicated e-Mobility R&D centre and has specialty cables and wire harnesses for the electric powertrain in its product portfolio. With regards to autonomous driving, the Company produces a number of cable solutions which connect the various sensors needed by an autonomous car to sense its environment. From 2014 onwards, guided by a new CEO with extensive sector experience, Gamenet implemented a new strategy based on the following pillars: (i) expansion into directly-owned gaming halls, both with medium and large formats; (ii) entry into the direct AWP management segments (“street operations”); (iii) increased presence in the betting business with the acquisition of the Italian operations of Intralot. The Intralot transaction was executed with the support of the Trilantic Europe team, which provided signification M&A expertise and led the negotiations with the seller. Today, Gamenet is the third largest Italian gaming operator, with a well balanced mix of products, led by a strong management team ready to fully exploit the upcoming market opportunities. The complete transformation achieved by the company since 2010 granted access to capital markets both from the equity and the debt side. In 2013 the company issued its first €200mn High Yield bond, whose proceeds were partly distributed to shareholders. In 2016 Gamenet successfully refinanced its debt lowering the interest rate from 7.25% to 6.00%. The company was listed on the Italian stock exchange on the 6 December 2017. As a result of the IPO, Trilantic Europe partially divested its stake. From its minority position, Trilantic Europe acted as catalyst in the transformation of Euskaltel. A comprehensive transformational plan was successfully executed, improving Euskaltel’s management functions, operations and financial performance. Euskaltel went through a thorough review of its internal organisation and operations, leading to the internalisation of high value added functions, the outsourcing of non-strategic activities, an optimisation of the sales channel mix and post-sale functions, and the refocus of network deployment. In addition to the operational improvements, several growth initiatives focused on a customer centric strategy were successfully implemented. The later resulted in an increased penetration in Pay TV from 17% in 2012 to 45% in 2014 as well as a higher percentage of fixed customers with mobile services to 49% in 2014 from 30% in 2012. On the financial side, Trilantic Europe’s helped bringing margins and cash conversion ratios to best-in-class levels across the industry. On the 1 July 2015, Euskaltel was listed on the Spanish Stock Exchange, with strong demand from high-quality investors. During its tenure, Trilantic Europe strengthened management by replacing 80% the incumbent management team and successfully created a single company with a central reporting process and new corporate identity dedicated to seafood. Our efforts delivered significant cost savings following the implementation of a purchasing audit, revamp of logistics processes, implementation of new ERP and restructuring of the SKU portfolio, shredding loss making volumes. Product innovation was at the core of our investment strategy and included the launch of “no drain” product in February 2009 a rare innovation in an otherwise “sleepy” canned seafood category. Following its investment in MW Brands, Trilantic Europe fostered certain company initiatives on environmental and supply chain sustainability. MW Brands became a founding member of the International Seafood Sustainability Foundation (ISSF) and worked with Greenpeace to develop and implement sustainable tuna fishing methods, eliminating bycatches and restricting the fishing of non- endangered tuna species. MW Brands also engaged a leading independent consulting firm as its scientific research advisor. The company implemented strict fishing measures, including a ban on the processing of illegally caught tuna. The company was sold to Thai Union, one of the largest seafood companies in the world, in October 2010. The case studies herein are not necessarily representative of the investments made by Trilantic Europe as a whole and have been included merely for purposes of illustrating the operational and value adding capabilities of Trilantic Europe. The case studies have not been included to exemplify the quality or performance of any particular investment or for any other purpose.